Mayor Paul Dyster, President Barry Snyder and Gov. 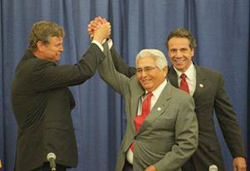 Andrew Cuomo are ebullient as they grip each others hands in a victory grip. A helpful Albany official (4th from left) explains to intelligent Niagara Falls citizens how extending the Seneca compact, without telling them until after it was done, was in their best interest. Mayor Paul Dyster hopes to find a path to peaceful progress now that the fiscal crisis, created by the gaming impasse, has been settled and money from the new agreement will begin to flow into the city shortly. This should help Niagara Falls get back on track with the capital plan already in place until the year 2016. 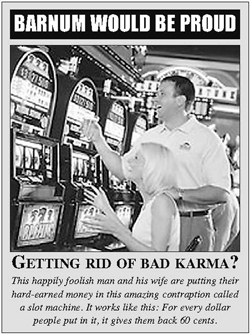 Dyster is aware of the criticism in some corners that lawmakers feel left out on the casino deal, especially with regards to the share of slot revenue the city receives under conditions of the casino pact, which has now been extended to 2023. While Dyster wouldn’t comment directly on the negotiations with regards to slot revenue, he did refer to comments made during the course of the negotiations to end the bitter dispute when the Senecas reportedly noted that the 25 percent revenue sharing paid to the state under the compact is among the highest paid by any of the tribes in New York. Under the new agreement, local communities, including Niagara Falls, will get the entire $140 million due in back payments from the Senecas, and the tribe will resume making the revenue sharing payments to the state, a source of income the city can now bank on. In other matters, the mayor says he’s hoping this week’s movie shoot in Niagara Falls (Thursday, June 27), which may reportedly include Blues Brothers star Dan Aykroyd and other Hollywood types including Kathy Bates, will move city lawmakers to consider spending $20,000 that is still available for the Blues Festival to possibly entice a blues performance in Niagara Falls. Council member [Sam] Fruscione just might be interested, Dyster said in talking about the visit from the Hollywood stars of “Tammy” who will be in town this week for the shoot. Asked for comment about the mayor’s blues suggestion, Fruscione is turning a deaf ear, saying he’s still committed to spending dollars on roads and sidewalks and not on any kind of blues festival. “No, I’m not going to go for this,” said Fruscione about possibly supporting the use of public money for a blues festival. Fruscione’s cool response is not unexpected, given the recent history of the council’s tight-fisted fiscal approach in the heat of the gaming dispute. It may take some time for the administration and the council to get on the same page when it comes to creating a city with some cultural appeal while still maintaining a quality of life for its citizens with limited resources. The mayor is also hopeful that in the improved fiscal climate, lawmakers might consider revisiting the NACC (Niagara Arts Cultural Center) funding issue, a hotly contested item that sparked plenty of debate in the midst of the fiscal crisis when the council cut $30,000 in bed tax money earmarked for the NACC. “Maybe the [council] should circle back,” Dyster said after hearing about the efforts made by the NACC to match a grant from the Oishei Foundation to help keep them afloat. In all, it sounds like Dyster would like to work with lawmakers now that the casino money is coming, so that Niagara Falls can regain the momentum he feels was lost by the gaming fight and the delay in receiving money that was due for more than three years. If Niagara Falls is to build a better city, it will probably take city and state lawmakers working together instead of against each other going forward. That might be a lot to ask in a city known for its political infighting, but it’s probably the only way the city will really make serious progress against the many challenges it faces.